The re-elected President, Cristina Fernandez de Kirchner, wants export revenues from mining projects to be repatriated and converted to Argentine currency prior to their distribution. This rule change by the Argentinian government renders this country less attractive than it use to be to inward investors. It also serves as a reminder as to the myriad of risks involved in any mining operation. This one comes under the heading of Geo-political risk, as the re-elected government seeks to stem the flow of capital out of the country. Having this cash repatriated also gives the government the opportunity, further down the line, to introduce capital controls which would result in the cash having to be re-invested in Argentina. Whilst we watch developments here we stop to dwell on that much used word these days, 'contagion' and wonder if these external influences will have any influence on the neighboring states such as Mexico. This threat is not on Mexico’s horizon at the moment, but it does sit there as a possibility that we may have to face in the future. This rule change has already had an effect on those who are prospecting and mining in Argentina such as Extorre Gold Mines Ltd, (AMEX:XG) a company based in Vancouver that explores for gold and silver in Argentina, it suffered plunged 25% drop to $7.00 yesterday. This rule change may have short term benefits for Argentina, but over the long term it could be a game changer for them in that companies currently evaluating new projects in Argentina, will now be having second thoughts. Its not just this rule change, its realization that this government is willing to meddle with the status quo. The environment now has an air of uncertainty about it, the lack of a level playing field will deter many investors and encourage them to look and invest in what are perceived to be mining friendly jurisdictions. Once again we have to question the wisdom of owning mining shares as the vehicle to gain exposure to both gold and silver. Our strategy has been to acquire both physical gold and silver along with a selection of quality producers and a few well thought options trades. This strategy worked well for us in the early years of this bull market, however, over the last few years the stocks have struggled to keep pace with the metals as evidenced by the sluggish performance of the Gold Bugs Index, the HUI. 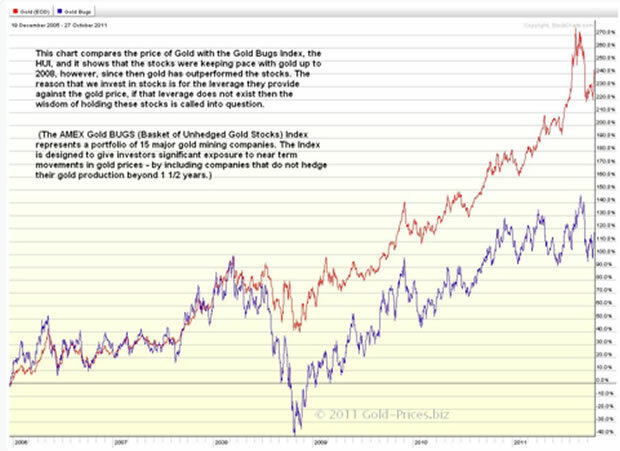 The chart above compares the price of Gold with the Gold Bugs Index, the *HUI, and it shows that the stocks were keeping pace with gold upto 2008, however, since then gold has outperformed the stocks. The reason that we invest in stocks is for the leverage they provide against the gold price, if that leverage no longer exists, then the wisdom of holding these stocks is called into question. Its true that there will always be stocks that 'outperform' and if you are a very good stock picker then your returns may well do better than the physical metal, but in general terms this is not the case. This lack of performance has been a cause for concern for us for some time now and maybe we getting close to a radical re-allocation of our funds, which would take into consideration the exclusion of the mining sector in total and the utilization of other vehicles in order to achieve our investment goals. One of the indicators will be the future performance of the HUI, if it can rally back to the '600' level and break through it with some gusto then maybe we can commit funds to this sector with some confidence, until then we will keep our powder dry. Stay on your toes, volatility will be the order of the day and have a good one.